Homespun Stitchworks..... For the love of vintage: A little too early off the block! Yesterday I braved the cold and set off around some charity shops in the area. My first mission was not as successful as I had hoped but did yield some goodies! I found a granny blanket in crochet and a jumper. I was told they had lots of bits in but had not gone through it all and priced it. Nevertheless I am happy with my treasure... I am going to make another trip on Friday to look again and see what I can see. 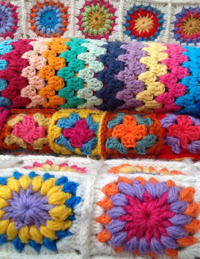 I am going to felt the wool jumper to cut up and use and the crochet granny blanket is mine as a lap blanket. I am also sorting my business diary today and making sure I have all my deadline dates in for magazine work, after which I am going to be cutting out my mermaid tail for a sampler I am doing. My design book is brimming with new ideas and designs so it is a case of nuckling down and getting on with the stitching. Open fires are blazing here by 3 ish and then I move myself there with my hand stitching and embroidery until it is time to stop. I hope you all have a great day and I am off to my stitching room.